Are Men Talking Too Much? The GA Tally Will Show You When They Are. "Inclusion is more nuanced than knowing who’s in the room, because not everyone has equal power or visibility. Often, even in rooms that seem gender-diverse, men still dominate conversations to a large extent." A year ago this week, we partnered with Cathy Deng, creator of the GenderAvenger-inspired arementalkingtoomuch.com, to add a new function to the GA Tally that allows users not only to count who’s present on a conference stage, cable news panel, etc, but also to time how long they talk, which reveals who is dominating the conversation. 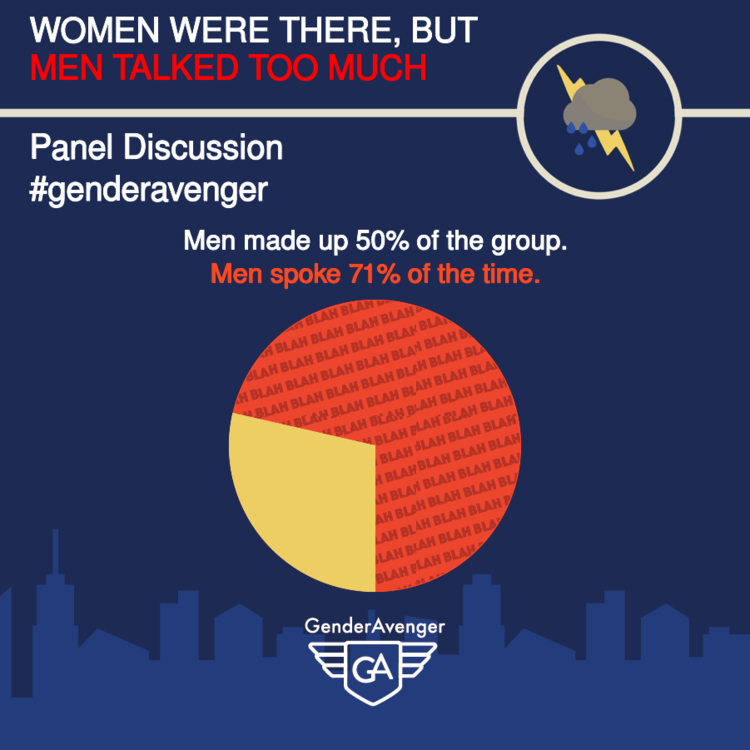 It is an easy-to-use timer that measures when a man is talking vs. a woman calculates the percentage of time men have talked relative to their number in the discussion. If men talk considerably more than their representation, their part of the pie chart says, “blah, blah, blah”. This function has become popular in an unexpected but critical environment: the workplace. Avengers have used the GA Tally timer to monitor meetings at their respective organizations and use that data to develop agenda criteria and create meeting environments that encourage equal talk time. We’ve heard of one man who used the app to make sure he didn’t overspeak in meetings, and one meetup group which has used the GA Tally and checked in at 20 minute intervals so that all participants could be aware of the overall balance of the discussion. Sometimes unintended outcomes can be great outcomes which is definitely true in this instance. Especially because we have learned that gender imbalance has a profound impact on workplace dynamics and the advancement of women. Princeton and Brigham Young Universities have done research and estimate that men will consume an average of 75% of talk time at meetings with equal gender representation. Since the original introduction of the GA Tally timer, we’ve added a pause feature that makes it super easy to toggle between who is talking and for how long and takes into account interruptions for lunch, unexpected guests and, in case you are using it for your favorite dvr-ed talk shows and want to take a bathroom break. When you watch or listen to a political talk show, do you find yourself thinking that the men are taking up too much space? Time who’s talking. 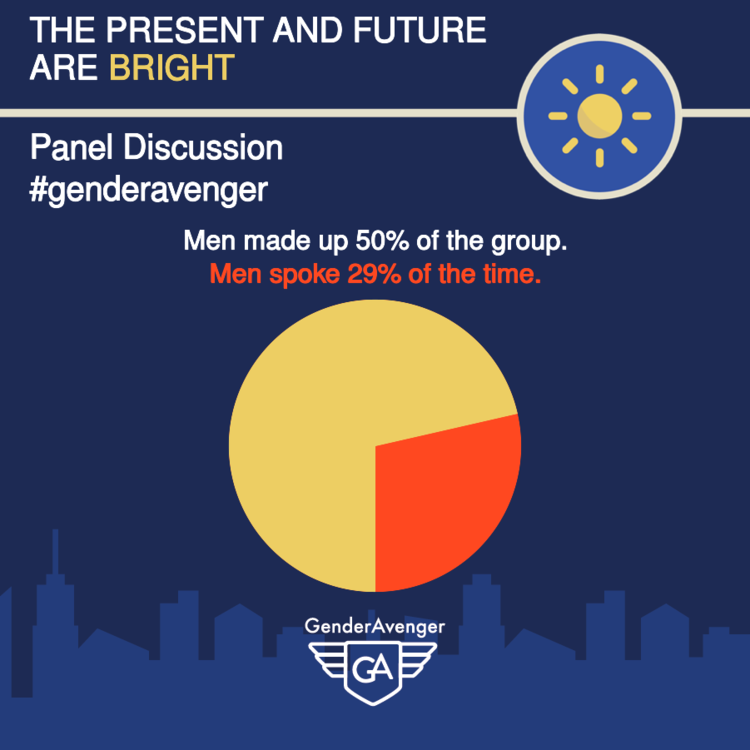 Are you at a conference with both men and women on a panel but feel like women are not getting equal time? Time who’s talking. Then, share the tally so the conference community or your team at work can become aware that, even if they are equally represented, if women are not allowed equal speaking time they sometimes may as well not be there at all. I bet you didn't realize that even small acts like leaving an app store rating can change the world. Ratings help more potential Avengers find the tools they need, so please take a moment to rate us and spread the word about this valuable tool!